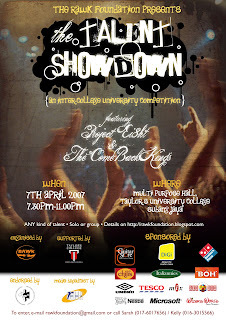 It is a talent competition and any kind of talent is welcomed - singing, juggling, burping, bands, anything at all.. The winners are determined by the audience through a voting system. Participants or audiences are warmly welcomed. This event's purpose is mainly a fund-raising project for the National Autism Society of Malaysia (NASOM). The organiser who is in charge of this event is RAWK Foundation and it stands for Reach Autism With Kindness. All the admission money collected will goes to NASOM. For any enquiries, u can on to RAWK Foundation's blog that is rawkfoundation.blogspot.com or email at rawkfoundation@gmail.com or call Sarah(017-6017656) or Kelly(0163015566).